Chapel Street is the one of the most unique areas in Melbourne. It is one of few areas in Melbourne where two extremes of people seem to co exist. The posh, eccentric and superfluously extravagant - those living in excess and celebrity, illuminate and consume the area, especially the north side. Littered across the strip, though, are the grimy, homeless, crime riddled and desperate. These scruffy creatures tend to bring the pretentiousness of the place down, distancing it from the cringeworthingly bland Toorak and Malvern boutique villages - they give it some life and reality. Chapel Street is a place endlessly fascinating for young people, one area that feels more like Sydney than Melbourne; shedding the propriety and culture, instead packing an excitingly superficial, hussle-bussle feel to it. The slightly posher, more 'mainstream' part of the strip is located on the north side, towards Richmond. The Jam Factory, well known retail brands and stores, sophisticated cuisine, along with many sociable yet swanky bars and cafes litter this side of Chapel. There's a definite urban, city like feel on the south side- impressive buildings, big name brands and suited up business people. However, this is a far more posh crowd than you'd encounter in the busier areas of the Melbourne CBD, free from the grimey, overly random feel of Melbourne's chaotic, filthy and crime filled inner city area. Being a male in his early twenties, the bar and club scene of Chapel is an attractive one to this writer. Clubs on this side of Chapel such as The Imperial Hotel, Bridie O'Reilly's (A lively smorgasbord of fun from Thursday to Saturday), Katuk, The Warehouse and Love Machine (tucked just off Chapel) are friendly and accessible. The crowds frequenting these areas tend to be young students or professionals, who attend in groups. Although friendly and more mainstream, the area at times gives off a pretentious feel, and lacks eccentricity. It is when one walks down Chapel St, towards the South side, that one gets a real sense of the uniqueness and contrasting nature of the strip. The grungier clubs, more eccentric bars and cafes, and 'hipper' crowds tend to be situated after the Commercial Rd intersection; the poshly dressed, mainstream bar hoppers avoid this area. It's a delightful experience to immerse onself in this area, whether at night or during the day. Outlandish and affordable places for food and drink fill this area, including Ruby Tuesdays, Wonderland, Basque and Tusk. At night, walking down this strip, from end to end, can be an exciting and enthralling experience. The contrast in people and sights really get ones juices flowing. Some say Chapel Street in recent years has degraded into a dirty, dangerous and dingy area that attracts an inconvenient crowd for the Toorak, South Yarra and Malvern dwellers nearby. 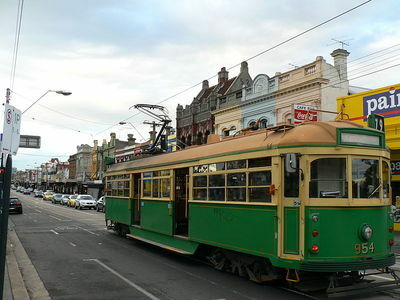 This may be true, but one cannot argue that it still holds its lively charm- far more pleasant than the ruckus of the CBD, more upscale than the St Kilda nightlife area, and more exciting than Lygon St; Chapel Street remains my preferred choice, whether for a quiet lunch for friends, or a lustful night out.